Last Thursday, I took the day off from work and set out for a 20 mile run. I'd attempted one other 20 miler a few weeks prior, which I had to cut off at 13 miles due to some stomach issues - also know as runner's trots. Hey, it happens. This particular day, I had a light breakfast (bowl of cereal) and a stabilizing snack before my run (a piece of toast with peanut butter and banana). I started my run at 11am, and the weather was perfect - 30 degrees and sunny. 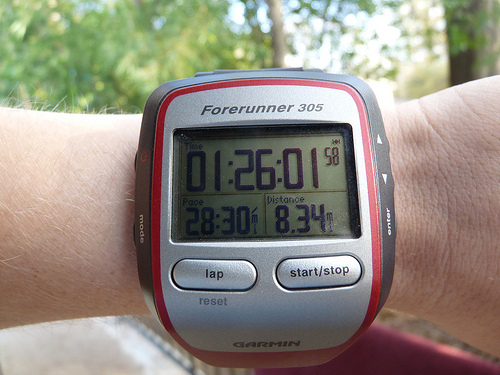 I finished my run in three hours and 24 minutes, with an average pace of 10:13. Basically, it was the best long run of my life. Even though the last mile was tough, I felt strong, capable and ready for the marathon. 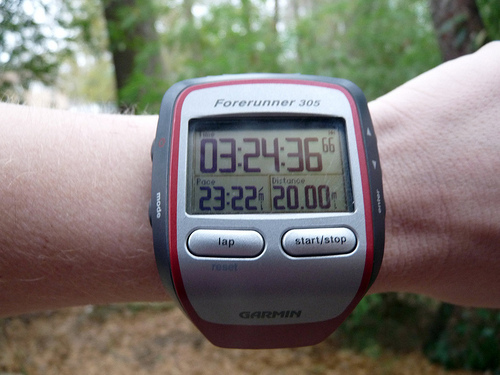 Fast forward to six days later, when I once again attempted to run 20 miles - my last long run before the taper. Running 20 this close to the marathon (it's only ten days away! Eek!) was cutting it close, but after discussing my training with a friend who happens to be an excellent runner and a coach (hi, Chip!) I decided that I had enough rest days built into my training that a ten day taper would suffice. I'm low on vacation time and I had a morning meeting, so I couldn't start this run until nearly 2pm. I ate a big bowl of cereal for breakfast, a mid-morning snack of peanut butter filled pretzels (probably closer to three servings - those things are addictive! ), two cups of coffee, and a peanut butter and banana sandwich for lunch. A lot of food for a normal day. Way too much food for a long run day. Needless to say, the distance you see in the photo above is as far as I could make it - right at mile 7 I was hit with a terrible case of runner's trots and was forced to speed walk to a bathroom. I tried to continue running, but it was clear that I was in no shape to go 12 more miles. Instead I went home, spent some time in the bathroom, and then felt well enough a few hours later to go to yoga. Eating more than one meal before a long run. On runs under six miles, I don't need anything - especially if I'm running first thing after I wake up. My best runs happen at 6:00am, which is good since most races are in the morning! Drinking too much coffee. This is tough one to control. During marathon training, I did a lot of my long runs later in the morning, when it was warmer. The temptation of a bottomless cup of Joe was difficult, but I was (mostly) strong. Peppermint tea helped. Even though I know these are my triggers, and can usually avoid them, sometimes it can't be helped. In those cases, I cross my fingers and start running, hoping for the best while making sure I know where the closest bathroom is at all times. And while I didn't finish my last long run before the marathon, I do feel prepared to run 26.2 miles in ten days. (Ten days!) During the course of my training, I managed to complete two amazing 16 mile runs, one pretty good 18 miler, and a killer 20. Sure, another successful 20 miler would have been great, but even without it I I'm still in better shape for Houston than I was for Austin. Plus the only record I want to break is my own, and I am 99% that will happen in ten days. (Have I mentioned yet that the marathon is in ten days? Because it is.) I'll post my goals for the marathon and a fuller reflection on my training next week. Until then, I plan to keep going to yoga, running shorter distances, avoiding runner's trots and enjoying my taper for all it's worth.